"We’re separated — they broke us," said a woman who had several family members detained in the raid. Every day for the last month, Aneth's 3-year-old daughter has asked her the same question: "When is Daddy coming home?" She searches every room in the house for him and wonders why he wasn't there for her birthday. Aneth cannot bring herself to tell her youngest child that her father was detained by immigration authorities in what advocates say was the biggest workplace raid in a decade. It's been more than a month since Immigration and Customs Enforcement officers detained 97 people at a meatpacking plant in eastern Tennessee, upending dozens of families and leaving many fearful of what could come next. “It hurts so much," said Aneth, 38, a resident of Morristown, Tennessee, who asked that her last name not be used, or the names of her children, out of concern for her family's safety. "I don’t even know how to explain it to them because they wouldn’t understand,” said Aneth, who also has a 5-year-old son and an 11-year-old daughter who is old enough to know that her father, Alberto, remains detained in Louisiana awaiting a bond hearing this week. “We used to do everything together,” Aneth said of her husband of 15 years. The raid appeared to be part of ICE's recent efforts to step up enforcement of immigration laws in workplaces. Attorney General Jeff Sessions mentioned the raid in a speech on Tuesday, saying that he wasn't "shedding tears" over it. "You don’t get to gain a competitive advantage in this country by having large numbers of illegal workers working for you so I’m not shedding tears about that," he said in remarks at the Gatlinburg Law Enforcement Training Conference in Tennessee. 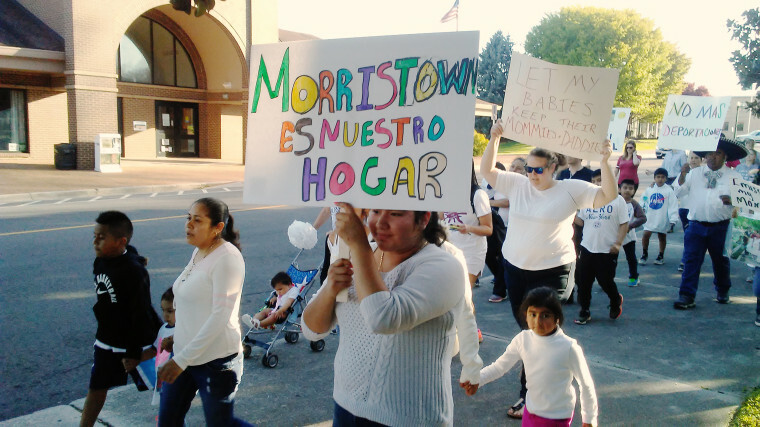 Immigrant rights advocates said the Tennessee raid was the biggest since a 2008 raid in Postville, Iowa, where nearly 400 immigrants were detained at a slaughterhouse. "It certainly feels, in many ways, that history is repeating itself," Stephanie Teatro, co-executive director of the Tennessee Immigrant and Refugee Rights Coalition, said during a call with reporters on Monday. "The impact of this raid extended well past those 97 workers who were arrested." Hundreds of people gathered at a church in the days after the raid, desperately trying to find their family members. Nearly 600 children from the district missed school as fear spread through the tight-knit immigrant community when it became clear that dozens of fathers, mothers, siblings, sons and daughters weren't coming home. “We are taking worksite enforcement very hard this year,” Homan, who recently announced that he plans to retire, said in a speech. He added that ICE was going to both prosecute employers who knowingly hire people who are not legally allowed to work in the U.S. and deport those workers. In January, immigration agents raided nearly 100 7-Eleven stores nationwide and arrested 21 people in what was then the biggest crackdown on a company since President Donald Trump took office. On April 5, ICE's sweep came to Tennessee. ICE executed a search warrant at Southeastern Provision, a meat processing plant in Bean Station, according to Bryan Cox, spokesman for ICE’s southern region. ICE said it found 97 people at the site who were subject to deportation from the U.S. Ten people were arrested on federal criminal charges, and one was arrested on state charges related to a fraudulent driver's license, according to Cox. The remaining 86 were arrested on administrative charges and placed in deportation proceedings, Cox said. Of that group, 54 were placed in detention centers and 32 were released from custody while they await hearings. Court documents show the plant was under investigation on charges of evading taxes, filing false federal tax returns and hiring immigrants who are not legally allowed to work in the U.S. Calls left at Southeastern Provision for comment were not returned. The plant’s owners have not been charged. Hahn said she believed that the way ICE carried out the surprise raid was meant to intimidate workers. Advocates said a helicopter hovered over the plant that morning, and authorities blocked off the street outside. "ICE made a decision to engage in the most aggressive form of enforcement at this work site," Hahn said, adding that the agency could have audited the meatpacking company rather than jumping to mass arrests. Asked about ICE's tactics during the raid, spokesman Cox said, "I suspect most persons who violate federal law and are arrested for doing so wish they hadn’t been." He added, "ICE will not turn a blind eye to persons it encounters who are in violation of federal immigration law." Teatro, whose group has been connecting families with legal aid, said the raid has left the community traumatized. "This is just a huge void in their lives,” she said. The remaining detainees have been going through their bond hearings, but it could be months before some of them will have their cases heard. "Their legal fight is far from over," Teatro said. “I was so scared, I felt impotent, my legs were shaking,” said Marce, who also asked that her last name not be used out of concern for her family's safety. Among those detained and held in Louisiana was Marce’s brother, Ponciano, 50. Marce said her brother helped found a soccer league for children and adults in their community and that he helped raise her three children. “Our lives were soccer and church,” she said. “He was the head of our family — the family needs him. The community needs him." Marce said the raid had devastated her family. “After that day, we’re affected emotionally," she said, her voice breaking. "We’re separated — they broke us, they took our confidence."